Brand New Items in Original Packaging. 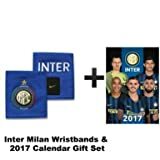 This entry was posted in Sports Kits and tagged 2017, Calendar, Inter, Milan, Nike, Wristbands by All Kits. Bookmark the permalink.